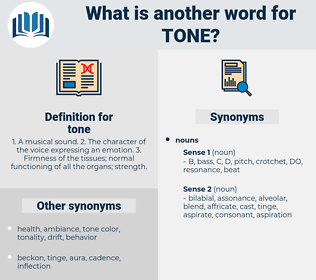 What is another word for tone? 1. A musical sound. 2. The character of the voice expressing an emotion. 3. Firmness of the tissues; normal functioning of all the organs; strength. Capita, note, pattern, beep, tom, spirit, atmosphere, direction, content, tuna, character, flavour, beeping, shade, thrust, trend. 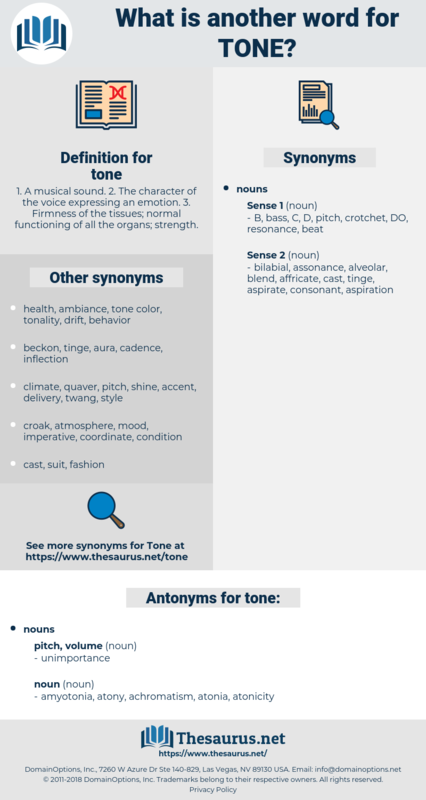 tonne, TONNES, tenor, accent, dialect, keynote, hue, ton, vein, voice, attitude, language, rhetoric, stance, orientation, emphasis. amyotonia, atony, achromatism, atonia, atonicity. He did not like this tone either. His tone was curter than his words. delivery, speech, manner of speaking. Colour In, colour, color in, colourise, color, colourize, discolour, colorise, discolor, colorize.